Here’s a little more about the ‘Foosteps of Arthur’ event at Glastonbury Abbey last Friday. Just to recap, in 1191 the monks of Glastonbury Abbey claimed to have found the bones of Arthur and Guinevere in the monks’ cemetry and displayed them in a large black marble tomb. Dr. Cheryl Allum, the Project Officer for the AHRC funded Glastonbury Abbey Excavation Archive Project talked about the archaeological evidence for the 1191 exhumation. Some people may be disappointed to hear that a lot of the archaeological evidence doesn’t hold up to scrutiny, but on the plus side lots of interesting Dark Age/ Post-Roman evidence has been identified during the recent project, for example the identification of Dark Age amphora sherds. Many of the other speakers highlighted that Arthur is a slippery yet compelling symbolic resource. Prof. Elizabeth Archibald discussed choices made by authors of modern Arthurian fiction, and unintentionally added significantly to everybody’s reading lists. Prof. Ad Putter gave us the opportunity to listen to some Middle English and examined the role of local landscape in these texts. Johnny McFadyen talked about Norman appropriation of Arthur, something which may have had a big role to play at Glastonbury in 1191. The main event for many attendees was the Q&A with Geoffrey Ashe, the man who put Glastonbury on the map with his book King Arthur’s Avalon. I interviewed Geoffrey and Patricia Ashe as part of my PhD and it’s fascinating to hear them talk in person about Glastonbury and Arthur. Prof. Ronald Hutton’s paper ‘The Historical Arthur’ paid homage to Geoffrey Ashe, who is currently celebrating his 90th year, and discussed Ashe’s place in the 20th century hunt for a historical Arthur. 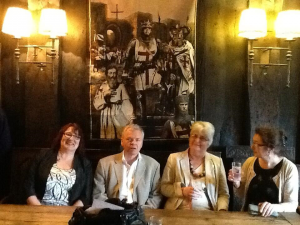 Kudos to the team at the Abbey, especially the Education Officer Julie Hayes for setting up this ‘Arthurian’ dream team of speakers (I exclude myself from that category although the paper went very well in case you were wondering). It’s been a pleasure working with the Abbey and this day was another example of their commitment to combining solid academic research with public engagement. I have decided to honour them with this fitting, but slightly less than flattering, photograph taken in the George and Pilgrim at the end of the day. So… I am speaking at a history event at Glastonbury Abbey this Friday. I’m just finishing up my paper and thinking about a few things. There are some big names there and I don’t class myself as an Arthur specialist. I’m focussing on what I do know about, interpreting objects and places. My paper is called ‘We don’t want Disney’ and it’s all about how hard it is to interpret Arthurian sites. Do you go for an all out ‘immersive experience’ and pull away from the archaeology and history? Or do you use sceptical academic analysis to illustrate that, now your visitors have paid their ticket price, they have bought into a historical fabrication? There’s a great article in ‘Public Archaeology’ by Orange and Laviolette (2010) A Disgruntled Tourist in King Arthur’s Court which examines some of these tensions at Tintagel. 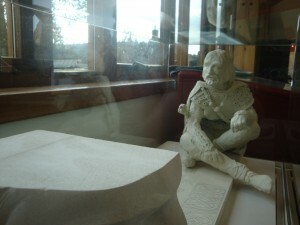 For many visitors, consuming Arthurian heritage is about connecting to your own sense of identity. Tackiness or scepticism can kill the magic. At Glastonbury Abbey while it is very difficult to demonstrate any hard facts, stories have had a real impact on the political and religious history and archaeology of the site. Today the Abbey still attracts people who are seeking out an experience which is greater than themselves. Will an exhibition or a text panel really achieve this? Can we can learn from the rest of the world when examining how ‘Intangible Cultural Heritage’ is interpreted in this country? Live story-telling, dramatic performances, music, poetry and art may acknowledge the importance of stories without pinning them down to a specific perspective. As I will discuss in my talk, Arthur is never going to be ‘easy’ to interpret. These stories are the focal point for centuries of debate about British identity and spirituality and that’s why they continue to be important today. If you want to witness me grappling with these issues in person, tickets are still available for the Foosteps of Arthur event at Glastonbury Abbey. This is the first of a series of short posts to flag up websites and blogs which I think are worth having a look at. 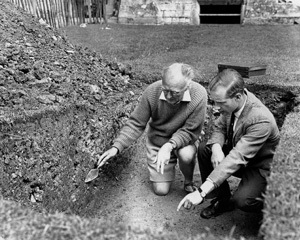 This one was developed with the Department of Archaeology at the University of Reading. 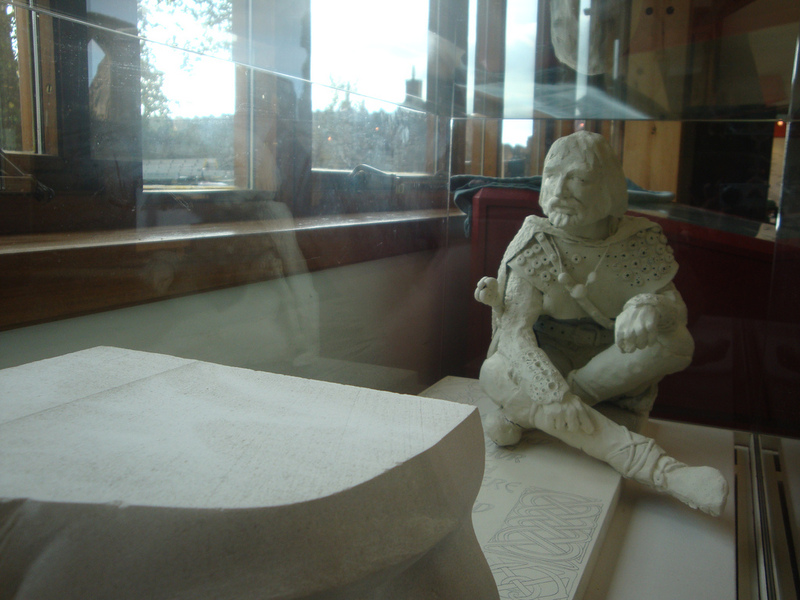 It was produced in collaboration with Runnymede and the AHRC and looks at diversity in Roman Britain. Romans Revealed challenges the perception that diversity is a modern phenomenon and encourages school age children to think about the lives of different kinds of individuals in the past.